Almost a Castle on Lake Gogebic, is a large, newer lake home on beautiful Lake Gogebic, a 13,000+ acre lake, famous for Walleye and Perch fishing, in the South Western portion of the Upper Peninsula of Michigan. It is open year round and is on the snowmobile trail. People love all the space in this very large lake front home with over 4,400 sq ft of combined living space on the main floor and second floor. 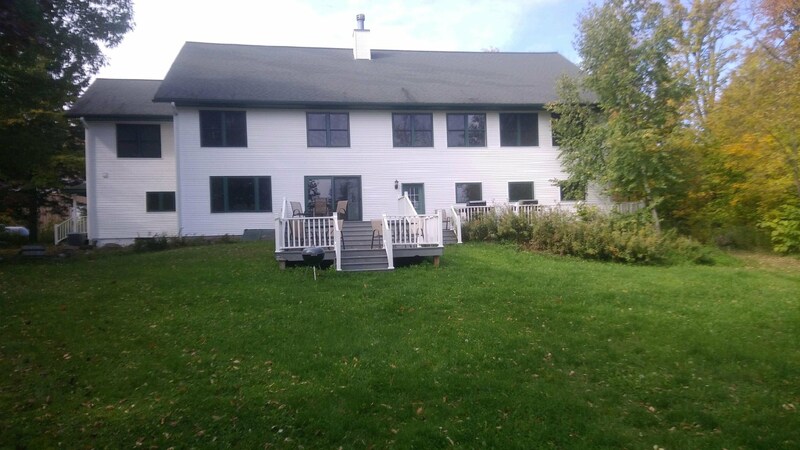 With 5 bedrooms, 2 living rooms, 3.5 bathrooms (2.5 bathrooms in the winter), fireplace, and 300 ft. of shoreline, you will get the vacation you want instead of being packed into a small cabin. If it is starting to feel expensive, look at our rates and you will see it costs about the same as most places half it's size. Many guests split the cost with another family because it can facilitate 14 people. Come see this area's great waterfalls and beaches, ride ATV's, snowmobile, hike, swim or fish. Catch Walleye's right from our pier or shoreline and then have a campfire while overlooking the lake. Below are some of the pictures and information on what this vacation home has to offer. Phone Number: 608-575-1343, For reservations, please call after 6:30 pm Central time M-F, or after 8:30 am on weekends. Dining table and part of kitchen Kitchen area overlooking dining table lake. Bedrooms: The master bedroom is enormous and overlooks the lake. It is approximately 25 feet wide by 30 feet long. There is another bedroom that overlooks the lake that is about 25 feet long by 20 feet wide. Both of these rooms have a king size bed and at least one twin bed in case one of your kids needs to be near you. Two other bedrooms are large enough to have a queen bed and at least one additional twin bed. There are four bedrooms upstairs and one bedroom downstairs. The downstairs bedroom has two twin beds and it's own half bathroom. see in this picture but it is to the right of the bed shown. Here are some other pictures of rooms in the house. and friends. This area also overlooks the lake. There is a large living room upstairs, (33' x 14') that faces the lake. It has lots of windows to and a great view of the lake. On the main floor there is also a living room attached to the kitchen and dining room with a fireplace all overlooking the lake. On the main floor there is also a rec room with air hockey, and a basketball game. The ping pong room is upstairs. The upstairs living room and the rec room have satellite TV's. You will appreciate having multiple living rooms on cold or rainy days so kids have a place to call their own. Off the master bedroom we converted a 10' by 20' closet Upstairs living room faces the lake. Bathroom's: We have 3 full bathrooms and one that has a toilet and sink = 3.5 total bathrooms. During the winter, we have to shut down the master bedrooms private bathroom, due to the risk of pipes freezing. There is still a large bathroom on the same floor as the master bedroom. The main floor will have 2 bathrooms available. The upstairs floor will have one very large bathroom upstairs available year round and one available May-mid October. Rates: Rates listed are for 10 people or less, either adults or kids (guests cannot be rotated or switched out throughout your stay as part of the base of 10 people. Additional guests cost $30 per night, per person. Maximum of 15 people. * Add 6% Michigan State Sales Tax to all prices. $500 security deposit required. Winter 2019: Jan 3 - March 4 (prices based on 10 people or less) 3 night minimum stay. * Based on 10 people or less. Additional guests add $30 per night per additional person. Late Winter and Early Spring 2019: March 5 - May 13 (prices based on 10 people or less) 2 night minimum stay. Additional nights: $300 per night unless you rent a whole week, then they are $200 extra per night after 7 nights. Additional nights: $275 per night unless you rent a whole week, then they are $200 extra per night after 7 nights. or less) 6 night minimum stay for that block of time. 6 nights: $2,100 additional nights $375 per night. 4 night minimum stay for that block of time. 4 nights: $1,700, additional nights are at $375 per night. Winter 2020: January 6, 2020 to March 8, 2020. (prices based on 10 people or less) 3 night minimum stay. 7 nights: $2,100 (Dates can only overlap with one weekend). Ex arrive Friday and leave on Friday not Sat. and Sat. Late Winter and Early Spring 2020: March 8 - May 13 (prices based on 10 people or less) 2 night minimum stay. 3 nights: $1,500 additional nights $425 per night. * note: different combinations of nights might be possible during this block of time, for example 8 nights between Dec 26 - Jan 3, 2021 = $2,750. * Based on 10 people or less. Additional guests add $30 per night per additional person. or less) 4 night minimum stay for that block of time. 4 nights: $2,000 additional nights (leave on Sunday Jan 3) $375 per night after night of Jan 2..
Jan 3, 2021 to March 8, 2021: January 3, 2021 to March 8, 2021. (prices based on 10 people or less) 3 night minimum stay. 7 nights: $2,100 (Dates can only overlap with one weekend). Ex arrive Friday and leave on Friday not Sat. and Sat. * Based on 10 people or less. Additional guests add $30 per night per additional person. Check in time: 4 pm Central Time or later. (if it was not rented that same day and it has been cleaned we can approve an earlier time). Check out time: 10 am Central Time. we approve a later time. * Note: your cell phone will show Eastern time at this site because it uses a cell tower in Bergland MI which is on ET, but the actual time zone at this house is CT not ET so 10 am on your phone is really 9 am. 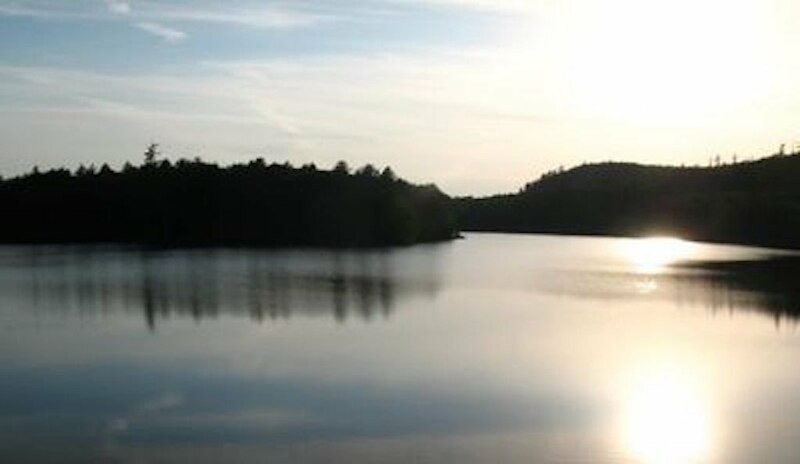 Location: It is located about 15 miles North of the Wisconsin border, North of Presque Isle, WI., and about 30 minutes West of the Cisco Chain of lakes near Watersmeet Michigan. Minocqua and Eagle River are both about 45 miles away. This means less boat traffic, more privacy, more fish and a better price for you. We are directly on the snowmobile trail and this area averages over 250 inches of snow. That's is over 21 feet of snow a year. All that water helps keep this lake full even in dry years. Fishing on Lake Gogebic: Fishing magazines frequently state that some of the Midwest's best perch and walleye fishing is on Lake Gogebic. Every gas station, restaurant, and business in the area has lots of jumbo perch fish mounts on their walls, with some perch over 2 lbs. There are a lot of 11"- 14" perch in this lake. This is one of the best Walleye fishing lakes in the Midwest. There are a lot of 14-22" Walleyes in this lake. Catch them from our pier or in one of the boats we provide at no cost. There are also some trophy Northern Pike and some very nice bass in the lake. There are multiple guides in the area who can really help you get on big fish, but I bet you can catch plenty of jumbo perch and other fish without one. Fisherman will enjoy some productive weed lines in 10-12 foot depths, about a 200-300 yards from our pier. Those weed lines are great for Jumbo Perch and Walleyes. Come in the winter and you will see lots of ice fishing tents in that area along with many other area's. Fisherman are consistently there for a reason; Jumbo Perch and great Walleye's. Happy faces and family memories. If Dan can catch nice fish anyone can. Big Northern Pike are in this lake. perch you will ever find. Boat Landings: There is a free public boat landing 200 yards away. There is also a state park public boat landing that is paved, 1 mile south of us that can be used provided you have a Michigan State Park Sticker. There are many other county park and state park boat landings around the lake. The lake is an all sports lake so you can use canoes, kayaks, sailboats, jet ski's and motorized boats. Boats: We provide a 14 ft. aluminum fishing boat. You are welcome to use our electric trolling motors and batteries, for free. Rent one of our 9.9 hp outboards for $150 per week or bring your own motor that is 15 hp or less. We also have at least one canoe that you are welcome to use. You can rent a pontoon boat from the Gogebic Lodge which is about 2 miles South of us. We cannot allow you to tie the pontoon boat to our pier overnight (and rental places do not want you to do that) because if big waves come, it will damage the boat and the pier. Snowmobile and ATV Trails: Want to ride your snowmobile? We are directly on the trail so you won't have to trailer up once here. Ride to Lake Superior which is about 35-40 miles north. The trail system goes for many miles in all directions. Ride on the lake. Once frozen properly this lake becomes a giant 18-mile long adventure land. You can rent sleds, ATV's and UTV's from several places near our cabin like Timberline Sports in Bergland MI. We have plenty of parking space for all your toys and have an older detached garage with openings at either end so you can drive right through it without having to turn your sled around. We ask that you use a boat landing 200 yards North of our house to access the lake because our shoreline has very large rocks and many boats lifts, piers etc. in the way. The boat landing directly connects to the snowmobile trail. (No snowmobiles allowed in our back yard). We and many others use the small forestry road across the street to access the official ATV trail system. Most township roads, and county roads are fair game to ride on provided you follow the rules and drive responsibly. Get an ATV map to make sure you are legal and don't get lost in this vast area of wilderness. Officially, UTV's are what is allowed on forestry roads, but this has not been enforced and the logging company that owns the land does not care if ATV's, UTV's. even trucks, use it. While that is officially the law, my neighbors, locals and visitors ride on them every day with ATV's without problems, as long as they are riding responsibly. You will see ATV's using these roads every day. In 2015 asked the MI State Patrol and they said the same thing. Go to: www.upsnowmobiling.com for free, printable trail maps for the area, and all of the U.P. Hundreds of miles of groomed trails are available right from our front door. Our vacation rental house has direct access to trail #1 on the Western shore of Lake Gogebic about 1/2 way down the lake. (Approximately 2 miles South of Fish Tales and 2 miles North of The Gogebic Lodge and Restaurant). Direct access onto Lake Gogebic is 150 yards away at a small boat landing, and part of the snowmobile trail. You can unload your sleds once here and never have to load up again until you leave for home. We have plenty of parking space. Snowfall: Due to wind with high humidity coming from Lake Superior, and then dropping as snow in the Porcupine Mtns area, Lake Gogebic gets more snow than Wisconsin and a lot of the U.P. The Lake Gogebic area gets an average of 250" of snow each year, and 300 is common, so trails get lots of new snow. In November and December of 2013, only 2 months, Lake Gogebic had more than 55" of snow and the trails were great. Downhill and Cross Country Skiing: Downhill ski on some of the best skiing east of the Tetons while only driving 30-40 minutes to ski resorts like Indianhead, BlackJack, Big Powderhorn, Norway Mtn, Pine Mtn, Porcupine Mtn. State Park, (downhill and cross country), Whitecap Mountain, and Mount Zion. Did you know that this area's average annual snowfall is approx. 250". There are several places to cross county ski. Check the Lake Gogebic Chamber of Commerce's web site for active cross country trails. We like to cross country ski down to the Lake Gogebic State Park or the County Park. This stretch has lots of undeveloped shorelines. Waterfalls and cascading rivers, The U.P. is filled with waterfalls and cascading rivers as they flow down to Lake Superior or other water bodies. Some of the best ones are 30-60 minutes drive from this cabin. 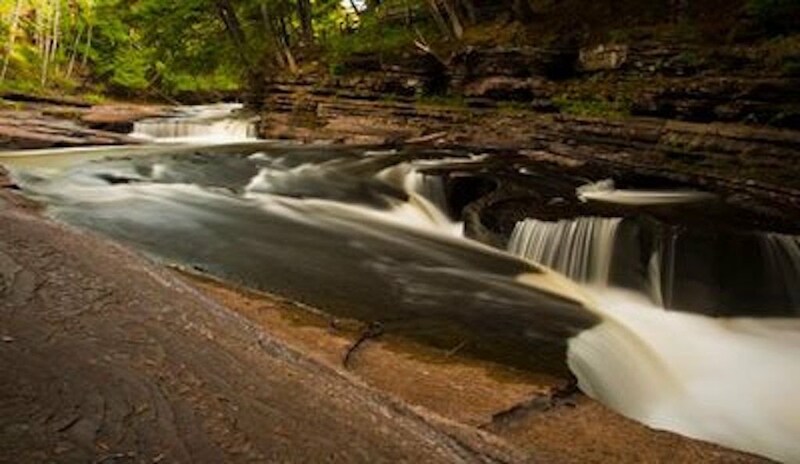 Here are a few to try: Presque Isle River Waterfalls, Gorge Falls, Sandstone Falls, Rainbow Falls, Bond Falls, Falls, Agate Falls, O-Kun-De-Kun-Falls, Suspension Bridge at Black River Harbor, Lake of the Clouds hiking trails and rock cliff overlooking Lake of Clouds, Copper Falls in Wisconsin. - Little Girls Point County Park along Lake Superior. Most of the beach is lined with quartz pebbles as far as the eye can see. - Presque Isle River where it enters Lake Superior. Beautiful sand and pebble beach overlooking a pristine shoreline. Hiking trails, and Mountain Biking: Take a hike along a waterfall. Most of the hiking trails at waterfalls, are relatively short ( 0.3 to 2 miles) and have bridges, boardwalks and improved trails. Some parts are wheel chair accessible. There are many more waterfalls than what we show here. Look at the Lake Gogebic Chamber of Commerce website, or Wilds of Michigan website for more. along the Lake Superior shoreline which is filled with beautiful quartz, rocks polished smooth to skip on the water. Agates and other pretty rocks are hidden treasures for you and your kids to find. We really enjoy going to Lake of the Clouds which is in the first range of mountains from the shoreline of Lake Superior. 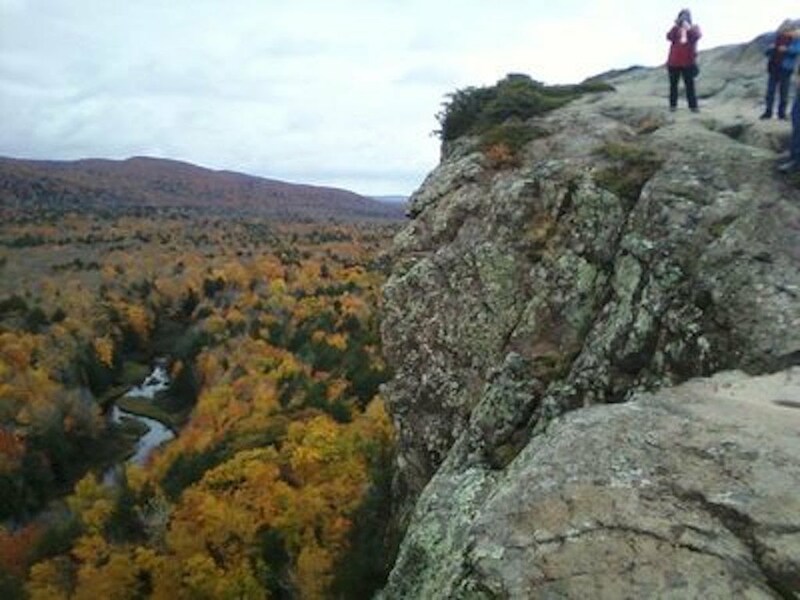 That park has many miles of hiking trails with some leading deep into the wilderness and others requiring little effort to overlook the Porcupine Mountains and Beautiful Lake Of The Clouds. Many people come to the area just to see the waterfalls. From Saxon Harbor North along the Lake Superior shoreline, there are many waterfalls to visit. Most waterfalls have trails, bridges and other improvements to help people view them. These tend to be great hikes for kids because most are approximately a 1-3 miles long and they have lots of fun walkways, bridges, terraces etc. for kids to run around on. 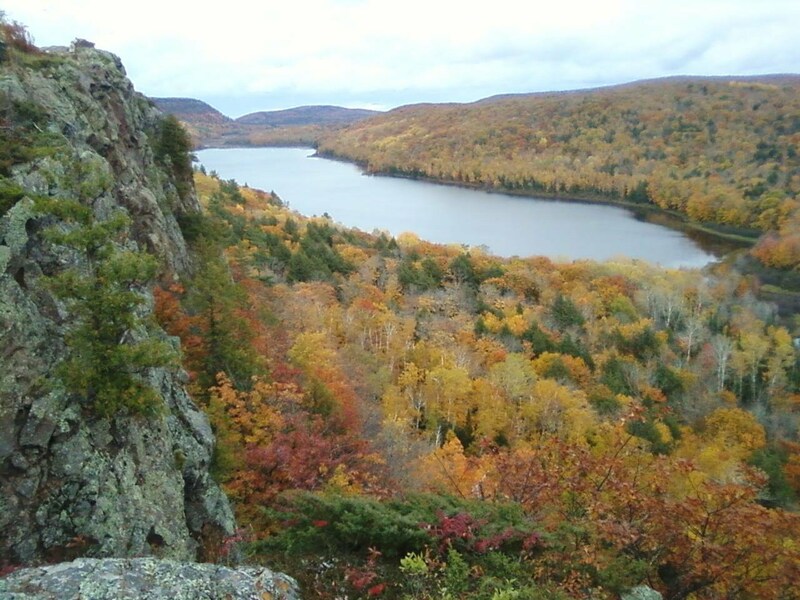 Visit Lake Of The Clouds in the Porcupine Mountains National Park. It has fantastic hiking trails all around the lake and mountains. It's only 35 miles away and you can drive almost to the very top of the mountain. Also be sure to go to some of the great waterfalls or take a hike along some of the endless Lake Superior beaches. The beach in the picture below is sandy. Many beaches are lined with quartz rocks, polished smooth and in colors from white to green and even reddish. Little Girls Point County Park is a great place to look for rocks and it isn't very far away. 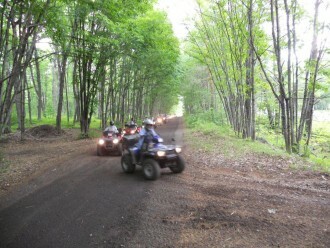 MI-TRALE offers over 500 miles of ATV, ORV, Multi-Use and Horse trails in the Western U.P. of Michigan. 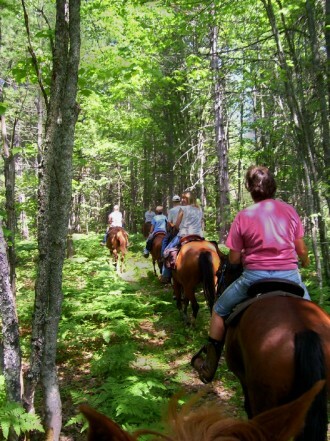 This trail system has separate sections set up for ATV's, motorcycles, and horses. Air conditioning if needed, It is rarely needed. ( $30 per day or $150 per week charge if we activate it via my computer). 2 grills, one is propane and the other is charcoal. (We have a propane tank but you supply gas and or charcoal). Aluminum fishing boat and boat lift for it. I also have one open boat lift for boats under 1,800 lbs. and that one is paved and has a nice pier. You will need a state park sticker for the State Park launch. Fire pit by lake, and you can burn any wood that is already fallen on the ground in our woods or a neighbor sells it. 2' - 3' deep and by 5' deep, which is approximate depth at the end of the largest pier, it is almost all sand. Paved driveway and plenty of parking for trucks with trailers. Directly on snowmobile and trails. Ping pong table, air hockey. 3 acre site with 300' of shoreline and woods that separates neighbors from this house on both sides. Laundromat available in towns nearby 7-10 miles away. (Due to potential septic system problems we can't let people use our washer and dryer. Grocery store, multiple bait shops, ATV and snowmobile rentals, gas stations available within 1-10 miles. No Smoking - Our insurance company does not allow any smoking and will not cover damages related to smoking. No parties, or large get-togethers (no more than 15 total people and all of all people must be listed on the contract). No loud noises: No fireworks, No radios or live music outside, on the driveway, deck, yard, pier etc. No riding sleds, ATV's or driving any vehicle in the back yard or on septic mound. No studded tracks on sleds on the paved driveway. We have a separate entrance and exit for sleds. may use with boats under 1,800 lbs. 2 other area's of deck in the back yard and all connected. about 8-10 feet wide. We also have 3 tables and about 12-15 chairs not shown. of woods between houses. between houses. Gentle slope from house to pier and lake Part of the front yard. There is about 3-4 times the amount of parking shown here. Want to see a different lake home to Rent? click on this link to access Big Bear Family Cabins L.L.C. a 6 bedroom lake house outside of Mercer WI. Bigbearfamilycabins.com It is a large lake home on a quite, private lake about 2 miles East of Mercer WI, 35 miles from Minocqua, and 50 miles from Eagle River. If you do a search online for it type into the search: big bear family cabins Mercer WI. Adding in Mercer WI, keeps a lot of places in California from coming up first. Go to one of the many waterfalls and the hiking trails along them. Lake of the Clouds State Park about 30 minutes away. The road brings you almost to the top of the bluff and then there is about a hike about 150 yards from the parking area. Lake Superior shoreline near Lake of the Clouds. This spot is sandy. Another one at Little Girls point near Ironwood, is all quartz pebbles in many colors. Lots of waterfall hikes in the area. 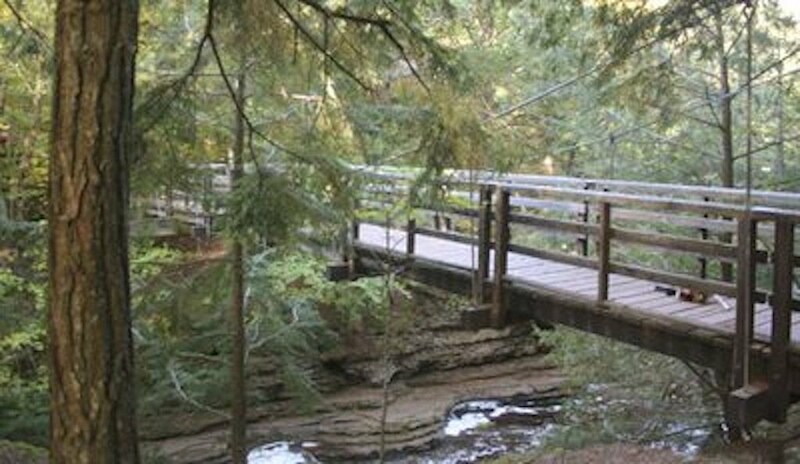 Most have improved trails with decks overlooking the falls. Many have wooden bridges like this one. Most trails are free if you have a MI state park sticker. You can check online which ones require a state park sticker and which ones require a county park sticker. Many Downhill ski Hills are in the immediate area: Indian Head, Black Jack, and many many more. Other Attractions: See: Wilds of Michigan, website which shows a lot of great outdoor hiking trails, waterfalls and attractions.